University of Utah seismologists install a nodal geophone on Kīlauea’s lower East Rift Zone in June 2018. This instrument was part of a network of 82 seismometers deployed temporarily this summer to help scientists study the magma transport system beneath the volcano’s eruption sites. USGS photo by B. Shiro. Kīlauea Volcano’s 2018 lower East Rift Zone eruption and summit collapse provided a rare opportunity to study dynamic eruptive processes beneath and at the surface of the volcano. In June, the University of Utah, in conjunction with the USGS Hawaiian Volcano Observatory (HVO) and funding from the National Science Foundation, installed a dense array of seismometers on the summit and lower East Rift Zone (LERZ) of Kīlauea. These instruments, called nodal geophones, recorded three-dimensional ground motion for about one month. In late July, the geophones were removed and shipped back to Salt Lake City for data download and analysis. Data collected from them will help scientists study the magma transport system beneath Kīlauea’s eruption sites. The deployed network of nodal geophones consisted of 82 stations. The instruments, which look like white coffee-can-sized cylinders, were pushed into the ground with a spike to keep them level and correctly orientated. Thirty stations were installed along a line perpendicular to Kīlauea’s LERZ, about 4 km (2.5 mi) up-rift from fissure 8. Twenty-four stations formed a partial ring around Kīlauea’s summit caldera. An additional 28 stations were scattered between the two main arrays, close to fissure 8 and on each side of the LERZ down-rift from fissure 8. 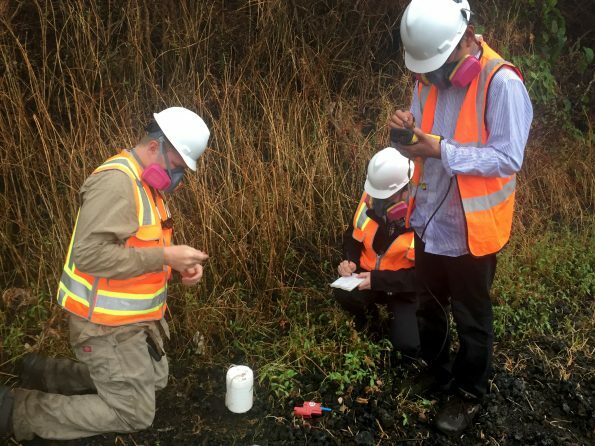 The main goals of this project were to image subsurface pathways that supply magma from Kīlauea’s summit to the LERZ, and to better constrain summit seismicity related to deflation and collapse as magma is evacuated from the summit reservoir. To accomplish this, scientists will examine earthquakes, tremor, and oceanic ambient noise from the temporary nodal geophone array, as well as from HVO’s permanent seismic network. This may help identify areas with high melt content and track how subsurface magma transport changed throughout the recent eruption. Scientists will also look at how seismicity changed over time and how those changes correlate with summit collapse events and changes in the LERZ eruption. Results from the study will help characterize how magma is fed to the LERZ from the summit. The long-held working hypothesis is that magma ascends from the upper mantle to a magma reservoir beneath Kīlauea’s summit and is then transported through a narrow conduit system down the East Rift Zone. The exact depths and shapes of these pathways, however, have never been accurately imaged. In addition, the study will provide a clearer picture of the magma reservoir beneath the summit of Kīlauea and the types of structures that were activated during the recent summit collapse events. Gaining a better understanding of magma pathways, the current status of magma within Kīlauea, and the dynamic process associated with volcanic activity will help USGS and other scientists improve forecasts. This, in turn, will support public safety during future eruptions. Data from this seismic array project will be made available through the Incorporated Research Institutions for Seismology (IRIS) Data Management Center. IRIS is a university research consortium dedicated to exploring the Earth’s interior through the collection, management, and distribution of seismological data. The University of Utah and HVO thank Island of Hawaiʻi communities and Hawaiʻi Volcanoes National Park for their support, which made the seismic array study possible. Results from the data analysis will hopefully be the topic of a future Volcano Watch article.